With much love and appreciation for your continued support, we are proud to announce the release of version 4.2, introducing Likes, local media management, and much more. Here’s the rundown of features and updates. We hope you ♥ it! We launched the foundation of Likes in the web app a few months ago and users have responded by liking over 20,000 episodes to date! Now it’s time to expand this project to the much wider Android user base. Like any episode from its detail screen, “…” menu, and – for the currently playing episode – from the player itself. You can find all the episodes you liked under Playlists | Likes – they will sync in the cloud, waiting for you on all your devices and the web. Likes are public by default – it’s a social thing! And you can share them with users who don’t even have Player FM installed, thanks to the web app. You can also make them private in the settings of your Likes playlist. As well as the social sharing benefit, Liking will help drive personalized recommendations in the future, ensuring you get the best of the best content on the topics you’re interested in. Premium users on Pro and Patron plans get an extra benefit of Likes. As with your other playlists, all your likes will be automatically backed up. Like an episode to ensure you can return to it later, even if the source content goes down or out. For a while now, you’ve been able to play local files within Player FM. A surprisingly high number of users do just that. 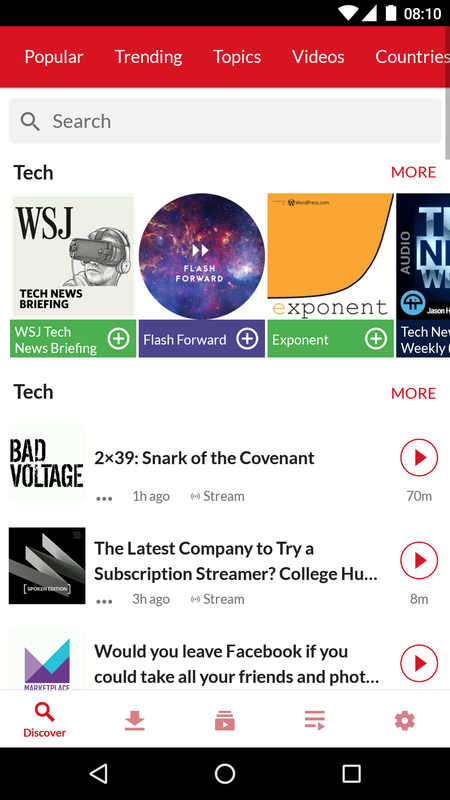 We’ve come to learn that users value Player FM as more than just a podcast app, but a way to play local media, due to the player interface, integrations (Chromecast, WearOS, Android Auto, etc. ), and advanced audio capabilities (speed control, silence skipping, etc.). 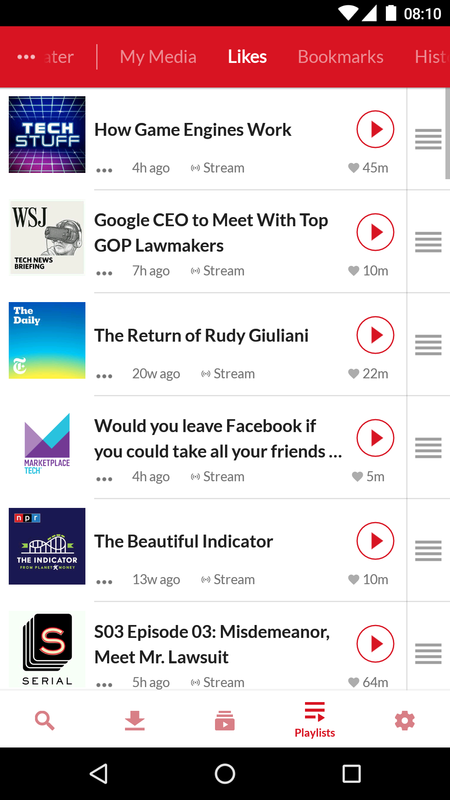 With v4.2, local media goes to the next level with the “My Media” playlist, a new section in the “Playlists” tab (as with Likes). 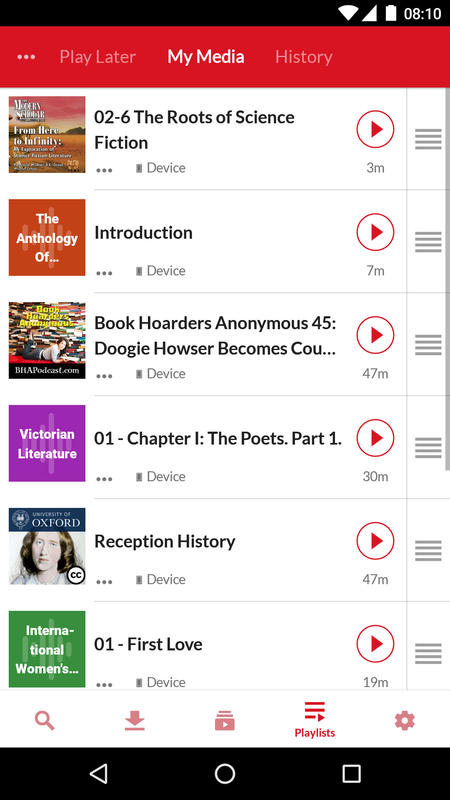 Now you can build up a list of files, re-order them, and surf with ease between the freshest podcasts on the internet and the hottest files on your device! We changed up the font style and went Lato. Your experience is now enriched with this eye-pleasing, easy-to-read font, which will help you enjoy with all your senses while searching for episodes and reading shownotes. Lato brings consistency to the whole platform, with the same font being applied across Android, iOS beta, and web, for the same experience across all devices and platform. We do respect the rules of the road for Android, and we know some of you will want to stick with the system font or the familiar Roboto font we used previously. So you can still choose those from display settings. Themes were previously chosen from within the Theme Editor interface. True to its name, this is a fine place to edit themes, but not so much for choosing themes. So now, when you access themes from the top of Settings, you will be greeted with an extensive gallery of theme previews. It will give you a greater insight into what’s possible without having to apply each of them. 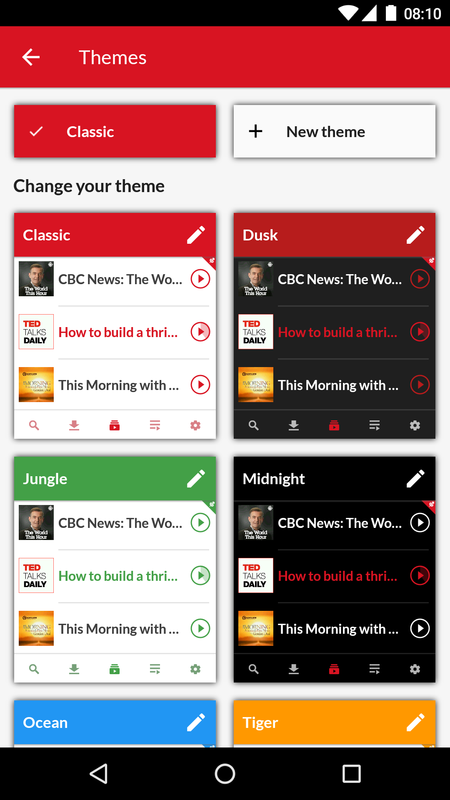 Premium users will see their own themes here too, and can tap to edit or delete any theme straight from the preview. You already have full play sync across Android, iPhone, and the web. Meaning, as a premium user, your play positions and “played” statuses are synced across devices. Player FM 4.2 extends this to give you “continue where you left off” functionality on any device. When you hit pause on one device and open the app on another device, the mini-player will already be showing you the same episode at the same position, ready to go. This feature applies on Android devices from today and will soon be added to web and iPhone. Up to now, the play button has been solid to indicate the episode is downloaded and empty to indicate it will stream from online. This is useful for some, but others want a cleaner interface, so we’ve decided to make this a new Display Setting. Play buttons will be solid unless you opt into make them reflect download state. And more! So. Much. Moar. To simplify bottom tabs, and in line with Google’s interface guidelines, only the current tab will show its text label. The rest will be image-only. Also, we’ve listened to dark theme users and made a nicer look for the bottom tabs. While on full-screen player, you’ll now get a sleeker, bigger, full-bleed design in which status bar and bottom navigation are made transparent. The subscribe button on series search results, related series screen and catalog has been updated and animated to be consistent throughout the app. A new launch screen will welcome you upon entering the app and when switching themes or font. Launch screens were once frowned upon in the Android world, but are an accepted part of the platform these days. It’s still a reality of mobile life that apps will take a couple of seconds to fire up after a cold state. The default image for series without podcast art has been improved to contain a background image and bigger text to give the series a prettier face. 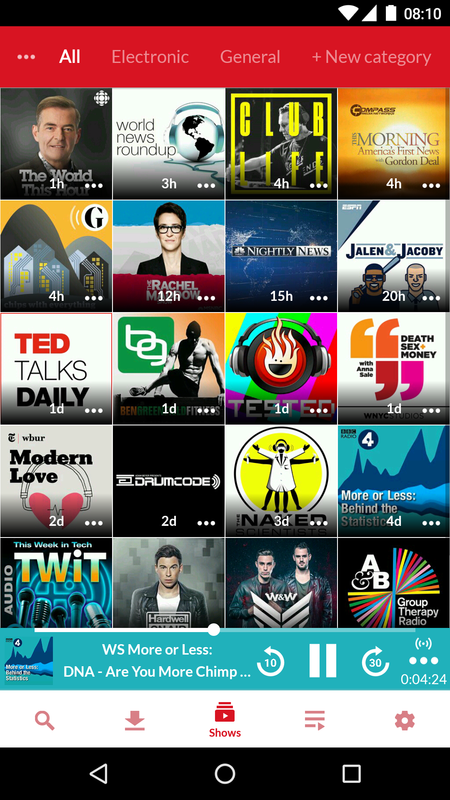 Local media images also gets a look distinct from the default podcast image. A little tweak on multi-episode selection. Back button will now act as an “undo”, i.e. de-select items, instead of sending you immediately back in the history trail. Confirmation dialog after tapping on [Mark all played up to here] on series detail screen. Improved mini-player layout on tablets. Let’s make use of all that luxurious space! Chime sound notification when bookmarking via headset shortcut action (premium). So you can skip looking at your phone’s screen when bookmarking that noteworthy quote through the headset shortcut. A new “small shake” option is available to extend the sleep timer (premium). “Small shake” means you don’t have to cause a minor earthquake in order to sleep another 10 minutes. If you’re sharing the bed with someone who enjoys their sleep, we think they’ll be grateful for this feature! 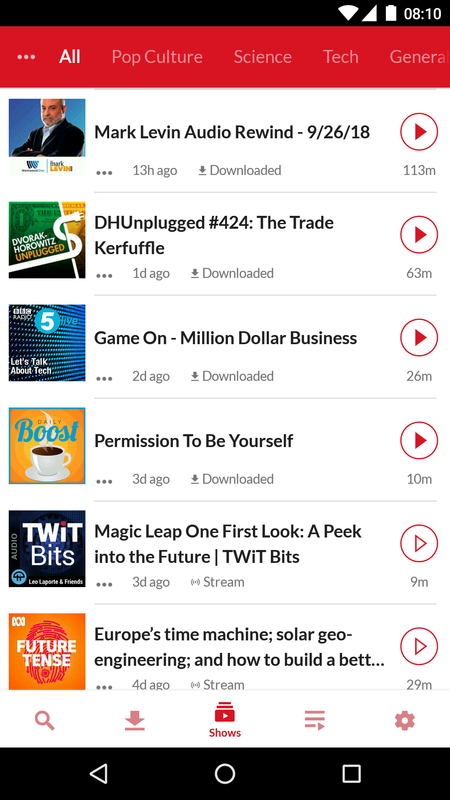 Grab your phones, go to Google Play Store, download our app and start enjoying podcasts.